Tips » When are mangoes ready to eat? The colour turns from green to orange, red or rosy, depending on the variety. The skin gives a little when pressed softly. If it is too mushy, the mango is over-ripe. The mango gives off a delicious sweet fragrance. 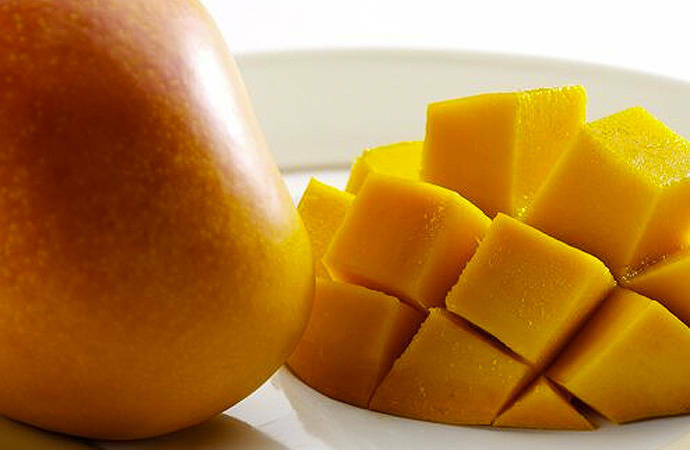 When selecting a mango, please note that mangoes don’t necessarily have to be evenly coloured all over. Some mangoes have a greater degree of ‘blush’ than others, and different varieties naturally develop different skin tones. Some mangoes may have small marks or skin blemishes. This is normal and is caused by the fruit rubbing against a branch or another piece of fruit on the tree. Small skin marks will not affect the internal quality of the flesh – they will still taste delicious! If you want your mango to last a few days at home before eating, select a slightly firmer mango with tight skin.